But how important is Social Media for your SEO strategy after all? Does it mean that the more successful your pages are, or the more active pages you have, the better you’ll rank on Google? Or are you are just wasting money spending that amount of time weekly on social media, when you could be focusing on something else? In this article we’ll answer some of the big questions on the “impact of social media on SEO in 2015”, according to Google, Kissmetrics and Quicksprout. SO, DOES GOOGLE’S SEARCH ALGORITHM CARE ABOUT HOW IMPORTANT YOUR SOCIAL MEDIA PAGES ARE? The short answer is NO (in 2015). We have learned that Google bots crawl and index Facebook, Twitter or Linkedin pages just like any other website. Meaning that it does not consider the authority of a social media account (number of “likes”, “pluses” or “followers”) when delivering search results. So posting a link on a Twitter account which has 5,000 followers does not mean the link will gain more authority than if it were posted on an account with just 50 followers. But does that mean you don’t have to worry about having huge numbers of followers? Well, not exactly! Just because Google does not factor in social signals does not mean social is useless for SEO. If a link from Twitter to your website were to go viral and be shared hundreds of times on Twitter, Google would acknowledge the high number of links and understand that the web page is popular and authoritative. Social media sites are invaluable for link building and virality so you should by no means neglect them. Search Metrics has correlated a number of factors to webpages ranking success on google, in order to answer the following question: What do web pages that are well-positioned by Google have in common and what distinguishes them from lower ranking pages? AND SHOULD YOU HAVE A PRESENCE ON AS MANY SOCIAL MEDIA WEBSITES YOU CAN? It’s not essential that you have a presence on all social sites, but it can be beneficial to have accounts on multiple platforms. Social profiles show up in the search engine results pages, so in order to dominate the all-important first page for searches of your brand, it is a good idea to have a presence on several social sites and ensure all your accounts are up to date and active. Google+ still gets preferential treatment when it comes to ranking (image above), with many businesses finding that their Google+ page is featured on the right hand side of the SERP for searches of their brand name. It’s not enough to simply have a Google+ page; you should keep it up to date and work on getting followers just as much as on all other social platforms. 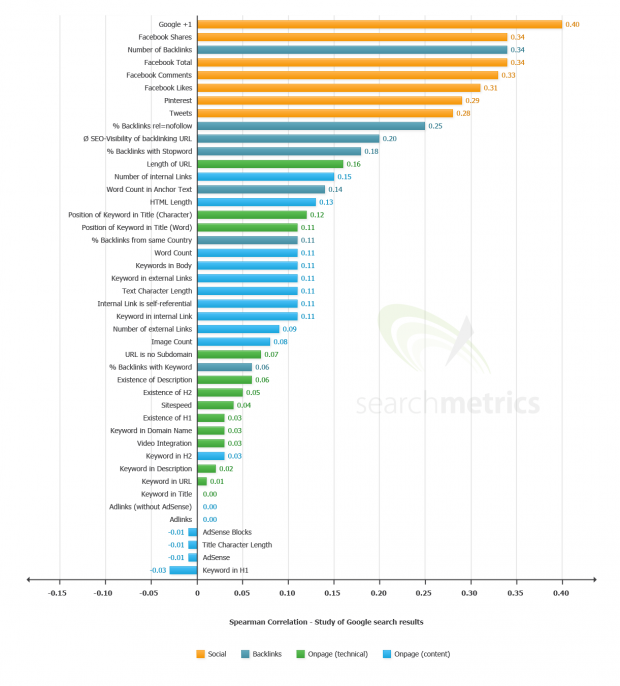 WHAT ELSE IS NEW IN SEO AND SOCIAL MEDIA STRATEGY FOR 2015? A strategy that has been receiving more and more attention is social SEO. When you consider social media platforms like search engines. Facebook, Twitter and YouTube each have billions of searches performed on-site each month; that’s a huge market you can tap into to expose your brand to a new audience and boost your online reputation. The best way to optimise for social search is to see what’s trending and get involved in conversations. Post updates regularly and make them relevant to current events or topics of interest. Plus, use keywords that are relevant to your industry, products and audience to ensure your social account is exposed to an engaged audience.